Then-Lt. Gov. Gavin Newsom at University of California Regents meeting. Then-Gov. Jerry Brown is behind him. If Gavin Newsom is elected governor of California in November, he would likely be the first one to have trouble with reading, or at least be the first willing to admit publicly that he does. For years, Newsom has been very open about the fact that he suffers from dyslexia, a neurologically based learning disability that makes it difficult to read, and which was a major contributor to making his school years miserable, even torturous. As governor, he would raise the profile of a reading disorder that affects between 5 and 20 percent of the population, and is only now getting the attention that it warrants. Last fall, the California Department of Education published the California Dyslexia Guidelines, as a result of a 2015 California law, Assembly Bill 1369, intended to help improve educational services for dyslexic children. In fact, Newsom mentioned that he had the reading disorder in his speech on Tuesday night after winning the top spot in the primary election. But to reach this point in his life — within sight of becoming the chief executive of the world’s sixth largest economy — he has had to figure out ways to manage his dyslexia. His views expressed in a variety of forums over a period of many years open a window into the painful world of students who have difficulties reading, the strategies they use to avoid being found out and the humiliation they experience when they are. The most revealing portrait of his struggles with dyslexia is contained in a frank conversation posted on YouTube to mark Dyslexia Awareness Month last October with 13-year-old Ryan Quinn Smith, a child actor who also suffers from the reading disorder. In it, Newsom explains how he was diagnosed with dyslexia during elementary school and attended after-school classes and summer school to cope with his disability. He recalls how his single mother, in order to protect him from any possible stigma, never told him that he was dyslexic until he was in 3rd grade and he accidentally came across a pile of papers about him in her room with the word “dyslexia” sprinkled throughout. What makes Newsom’s recollections especially compelling is that this disability is not something that is entirely behind him, but is a challenge that affects his functioning today and is likely to have an impact on how he carries out his duties as governor. It could also inform his views on education, in a state where the governor has considerable influence over education policies. 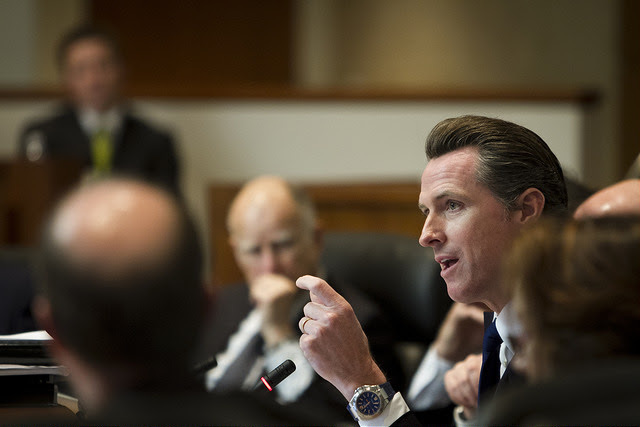 Newsom said that the disability has forced him to adapt, and given him certain skills that have proven to be assets in his political career. Anyone who has been around Newsom for any length of time will be struck by his extraordinary ability to describe minutiae of policy, along with facts and figures to back up what he is saying, typically without any notes. That skill is directly related to a disability that makes it difficult to sound out words by matching letters with sounds known as phonemes. Instead of having to read, he said he “overcompensated and learned to develop other skills,” including a highly developed ability to memorize texts. He has also developed other strategies to compensate for his reading difficulties. He said he can’t read a book or a newspaper article without underlining key words and sentences. All these strategies have emerged from what appears to have been an especially difficult school experience. He attended both private public schools, including the Hall Middle School and Redwood High in Larkspur. Newsom’s dyslexia was accompanied by — or contributed to — a painful shyness that caused him to sit in the back of the classroom and made him reluctant to participate in class discussions. Exacerbating his reluctance to participate was a severe lisp. He had to undergo speech therapy to overcome it. Newsom’s experiences have contributed to life lessons that guide him today. That principally means learning to be patient and realizing that “you don’t have to be perfect.” And that it is fine to make mistakes. “If someone told me it’s OK to make mistakes, that would have been so much more relaxing, because I was good at making mistakes,” he said. I am excited about the heightened awareness Gavin Newsom’s openness about being dyslexic will bring. Your article outlined great examples from his youth and how he still adapts. I hope we will see more coverage of the disconnect between current research on successful reading interventions and school practice. I recently read David Kilpatrick’s “Essentials of Assessing, Preventing, and Overcoming Reading Difficulties” and it was terrifying to learn how long it takes. I hope the Lieutenant Governor can alter the course. Thank you Gavin Newsom and Louis Freedburg for covering this important issue, as well as highlighting the Dyslexia Guidelines that have been made available to all schools via AB 1369. Mr. Newsom’s openness about his own struggles help de-stigmatize this learning difference, while increasing awareness for the guidelines should make it easier for schools and parents to understand how to help. Hopefully someday soon all schools will be able to help these bright kids reach their high potential. Thank you, Louis Freedberg, for covering the issue of dyslexia. Gavin Newsom’s courage in speaking out about his dyslexia for many years now has inspired so many students and families affected by dyslexia. With AB1369 dyslexia guidelines and the work of the UCSF Dyslexia Center supported by Gavin Newsom, California may be at a historic turning point of identifying dyslexia in elementary schools and teaching the 1 in 5 with the methods we now know work for this learning difference. Addressing this issue directly impacts society and the economy with effects on graduation rates, professional potential, and prison rates. Our population with reading disabilities is something we all have a responsibility to deal with as a society. Everyone deserves to be able to learn and to express themselves, and with research-based instruction and the technology in every smart phone, life can now be so much better for these individuals. When we know better, we do better. Awesome article! Thank you for focusing on the challenge of dyslexia. Gavin Newsom is a hero to many dyslexic kids and a hero to me for speaking out so publicly about the struggles they go through. Many thanks for this article for getting this very common but disabling condition into the sunlight. Thank you Mr Newsom for coming out about your struggles and triumphs with your dyslexia. And thank you Mr Freedberg for reporting about this learning diffference that effects 1 in 5 kids in our schools. Successful people like Gavin “coming out” is critical to helping young kids embrace their differences and strengths. And having a dyslexic person like Gavin as potentially the CEO of California makes it possible to hope that finally our educational establishment will do the right thing — from top to bottom — and conduct early dyslexia screening and provide evidence based instruction by teachers specifically trained to teach the science of reading and spelling to the 1 in 5. Thank you for shining a light on the path on the way to this education revolution. I want to thank Gavin Newsom for publically speaking about his dyslexia and bringing awareness to an issue that affects 1 in 5 people. I also want to thank Gavin for his support of AB 1369. All children deserve to learn to read. Our schools need education about dyslexia and evidence based training in reading instruction to make literacy a reality for all students. Gavin can help our schools and educators obtain the resources they need to make this happen. Thank you for this amazing article highlighting what it is like to live with dyslexia. My son and I are both dyslexic and the struggles are profound. I hope that one day dyslexia won’t be a “mystery” in the educational system. Thank you, Louis Freedburg for writing about the challenges students with dyslexia encounter in our schools, AB 1369 and highlighting Lt. Governor Gavin Newsom’s openness about his dyslexia. For too long, the instructional needs of these students have been unmet. It finally seems that the tide is shifting, but lasting, meaningful change will require significant shifts in the belief systems about how reading should be taught. Please consider doing follow up articles on Structured Literacy and “The Simple View of Reading.” Thank you! These are stories I like to share with not only my children but also adults, including educators. As everyone differs in the severity of their learning difference, it is helpful to hear the success stories and how they need to be continually resourceful in their current day-to-day work. As for Gavin Newsom, I’m very thankful he has been open about his challenges throughout his career from the beginning. I feel for the folks out there that are not comfortable about sharing their learning difference. Thank you for highlighting dyslexia and California’s dyslexia guidelines. Even though it is the most prevalent learning disability, dyslexia is often very misunderstood. I’m unconvinced of the severity of his dyslexia. He was able to read academic assessments about himself noting the word dyslexic. Even a moderately dyslexic third grader wouldn’t be able to read those papers. Sounds like a politician jumping on the dyslexia bandwagon to me.